It all started when I was a little girl. My grandfather used to create a scrapbook for every trip he and my grandmother took. He used to cut the pages and bind them with an embossed cover in the old fashion way by sewing them together. When it was done he glued all the photos in and embellished the pages with postcards, newspaper clippings and even dried leaves. I used to sit on the carpet with an album on my lap and look through the pages imagining I was there with them. When my first son was born my grandfather said "why not make him a scrapbook, an album full of photos?" I was always a crafty person and it sounded like a great idea. That was my first scrapbook. Little did I know it was about to change my life. The years went by and that baby grew and at the age of four he was diagnosed with Autism. I had to leave my job and I didn't know what to do. While I was searching and thinking of a solution I found myself spending more time scrapbooking. It was a great source of comfort and joy but slowly I realized it was drawing me in, it felt like someone is trying to tell me something. The message was loud and clear...this is what you are supposed to do, this is your destiny. Not in a heroic, happy ending fairy tale style but in a quiet, soul healing, joy giving way. I heard the message, I started a business for scrapbooking design and started teaching. My scrapbooks brought smiles to so many people and happiness to my heart. Since then I have expanded my mind, my art and my goals beyond scrapbooking and I still have more plans for the future. Art in any form is an amazing therapeutic tool to change your life, your view of life and the way you touch other's life. 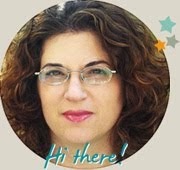 Hi Einat, I have been following you for a short time and want to let you know that you do great work and yes you do inspire me. Keep up the awesome inspiration.